Glossina pallidipes salivary gland hypertrophy virus (GpSGHV; Hytrosaviridae) is a non-occluded dsDNA virus that specifically infects the adult stages of the hematophagous tsetse flies (Glossina species, Diptera: Glossinidae). GpSGHV infections are usually asymptomatic, but unknown factors can result to a switch to acute symptomatic infection, which is characterized by the salivary gland hypertrophy (SGH) syndrome associated with decreased fecundity that can ultimately lead to a colony collapse. It is uncertain how GpSGHV is maintained amongst Glossina spp. populations but RNA interference (RNAi) machinery, a conserved antiviral defense in insects, is hypothesized to be amongst the host’s mechanisms to maintain the GpSGHV in asymptomatic (persistent or latent) infection state. Here, we investigated the involvement of RNAi during GpSGHV infections by comparing the expression of three key RNAi machinery genes, Dicer (DCR), Argonaute (AGO) and Drosha, in artificially virus injected, asymptomatic and symptomatic infected G. pallidipes flies compared to PBS injected (controls) individuals. We further assessed the impact of AGO2 knockdown on virus infection by RT-qPCR quantification of four selected GpSGHV genes, i.e. odv-e66, dnapol, maltodextrin glycosyltransferase (a tegument gene) and SGHV091 (a capsid gene). We show that in response to hemocoelic injections of GpSGHV into G. pallidipes flies, increased virus replication was accompanied by significant upregulation of the expression of three RNAi key genes; AGO1, AGO2 and DCR2, and a moderate increase in the expression of Drosha post injection compared to the PBS-injected controls. Furthermore, compared to asymptomatically infected individuals, symptomatic flies showed significant downregulation of AGO1, AGO2 and Drosha, but a moderate increase in the expression of DCR2. Compared to the controls, knockdown of AGO2 did not have a significant impact on virus infection in the flies as evidenced by unaltered transcript levels of the selected GpSGHV genes. The upregulation of the expression of the RNAi genes implicate involvement of this machinery in controlling GpSGHV infections and the establishment of symptomatic GpSGHV infections in Glossina. These findings provide a strategic foundation to understand GpSGHV infections and to control latent (asymptomatic) infections in Glossina spp. and thereby control SGHVs in insect production facilities. Tsetse flies (Diptera: Glossinidae) are naturally infected by the Glossina pallidipes salivary gland hypertrophy virus (GpSGHV, family Hytrosaviridae), a large double-stranded DNA (dsDNA) virus pathogenic specifically to Glossina spp., [1, 2]. In G. pallidipes, although the majority of cultured and wild tsetse fly species are asymptomatically infected by GpSGHV (low virus titers), some unknown factors can trigger symptomatic infections (high virus titers) . This, in turn, is associated with the occurrence of overt salivary gland hypertrophy (SGH) symptoms [4, 5]. In the mass rearing of G. pallidipes, SGH epizootics reduce fly survival and productivity, and have caused the collapse of three colonies; two in the Insect Pest Control Laboratory (IPCL) in Seibersdorf, Austria (in 1987 and 2001), and one in the mass rearing facility in Kality, Ethiopia (in 2012) . These GpSGHV-induced effects have significantly compromised the implementation of the sterile insect technique (SIT), a component of area-wide integrated pest management (AW-IPM) strategies designed for the eradication of G. pallidipes from the Southern Rift Valley of Ethiopia . Although it is uncertain how the virus is maintained within tsetse populations in nature and in laboratory colonies, three hypothetical scenarios may account for the maintenance of asymptomatic GpSGHV infection state. The first is a persistent infection whereby the virus remains in specific host cells with low-level production of virions, but without causing substantial cell damage . The second is a latent infection state, during which viral genomes and maybe some viral proteins are present in the infected host cells of certain organs, but without detectable production of infectious viral particles . In the third, the virus can exist in both persistent and latent infection states at the same time, but in different tissues . Persistent infection in the salivary gland (SG) cells is accompanied by a low number of virions (102 viral genome copies/fly) released by asymptomatic flies via saliva during feeding . In addition, detection of viral DNA in other tissues such as the tracheal cells without detectable viral gene transcripts  may reflect a latent infection state. In any case, the persistent or latent GpSGHV infection in G. pallidipes potentially represents a homeostatic equilibrium between the host’s immune system and the viral escape strategies. Consequently, the viral infection is kept under control (asymptomatic state), but is not completely eliminated from the fly. Amongst the possible host mechanisms that keep GpSGHV under control is the insect’s RNA interference (RNAi) machinery, which regulates both host and viral gene expression by use of small RNAs that bind to their complementary messenger RNA (mRNA) targets [12, 13]. This hypothesis is based on evidence from various studies indicating that the RNAi machinery is a conserved antiviral defense mechanism for several groups of large dsDNA viruses infecting insects, including the related baculoviruses and nudiviruses, as well as ascoviruses and iridoviruses [14, 15]. RNAi is mediated through three pathways: short interfering RNA (siRNA), microRNA (miRNA) and Piwi-interacting RNA (piRNA) pathways . The siRNAs are processed in the cytoplasm by the ribonuclease III enzyme Dicer-2 (DCR2) from exogenous double stranded (ds) RNAs (e.g. dsRNAs that arise as viral replication intermediates or from overlapping transcripts). These siRNAs destroy (viral or cellular) single-stranded RNAs (ssRNAs) in a sequence-specific manner . The miRNAs, on the other hand, are processed by DCR1 from cellular or viral pre-miRNAs, originating from DNA components of nuclear replicating viruses that are processed by RNase III enzyme Drosha in the nucleus . The miRNAs are then exported to the cytoplasm where they post-transcriptionally regulate cellular or viral protein expression, thereby modulating developmental and physiological processes of the host as well as virus infection [19, 20]. The piRNAs are processed via diverse pathways independent of DCR proteins , and are involved in the regulation of cellular genes and activities of transposons . They may also have a role in antiviral strategies, as has been suggested for arboviruses . In the RNAi biogenesis pathways, the siRNAs, miRNAs and piRNAs are loaded into Argonaute proteins 2, 1 and 3 (AGO2, 1 and 3), respectively, that mediate the RNAi by either cleavage or degradation of target RNAs (AGO2), translation repression (AGO1), or epigenetic modifications (AGO3) . However, some of the above-mentioned enzymes may participate in two or more of these pathways. For instance, in Drosophila melanogaster, DCR1 is involved in both siRNA and miRNA pathways, while DCR2 is only involved in the siRNA pathway. Additionally, Drosophila AGO1 and AGO2 enzymes may participate in both the siRNA and miRNA pathways . The siRNA-mediated RNAi pathway is a potent antiviral immune pathway in insects [21, 26] and is implicated in controlling the replication of RNA and DNA viruses [15, 27–30]. In addition, it has been shown for several viruses that the knockdown of RNAi pathway components leads to increased viral replication. For instance, loss-of-function mutations in DCR2 enhanced the susceptibility of Helicoverpa armigera to infection by H. armigera single nucleopolyhedrovirus (HearNPV) . Similar observations were made in Drosophila during infection by Flock House virus (FHV), Drosophila C virus (DCV), and Sindbis virus (SINV) . In addition to controlling viral replication, the siRNA pathways have also been implicated in establishing persistent virus infection . To establish persistent infection, viral fragments generated during viral DNA genome replication are transcribed or reverse transcribed for RNA viruses and integrated into the host genome. The generated transcripts are processed by DCR2 into virus-derived siRNAs (vsiRNAs); the vsiRNAs are then loaded into AGO2 to mediate specific cleavage of viral mRNAs, leading to persistent infection [32–34]. In the case of GpSGHV infections, the outcome of RNAi-based immune responses would hypothetically be restriction of viral replication and prevention of the development of overt SGH. If this is indeed the case, then virus and host would progress into a stable equilibrium of a persistent or latent infection state, which may account for the widespread chronic asymptomatic GpSGHV infections in many tsetse species, particularly in colonized flies . In the current study, we evaluated whether GpSGHV infection induces an RNAi response in G. pallidipes and whether this would downregulate the development of SGH and instead induce a covert infection state (persistent or latent). To accomplish this, we performed comparative analyses of the expression of AGO, DCR and Drosha between artificially (intra-hemocoelic) virus injected and uninfected (PBS injected) individuals, and between asymptomatic and symptomatic infected flies (with overt SGH symptoms). It should be noted that artificial injection of the virus does not result into overt SGH in the same (parental) generations but in the progeny flies . We complemented these bioassays by testing the impact of downregulation of a key component in the siRNA pathway (AGO2), on GpSGHV infection in G. pallidipes. The data obtained in this study offer a rationale for similar studies on other Hytrosaviridae family members and may open novel strategies to manage SGHVs in insect production facilities. The analyses of the genomes of G. pallidipes, G. m. morsitans, G. f. fuscipes, G. p. palpalis, G. austeni and G. brevipalpis resulted in the identification of AGO 1, 2 and 3 in all these species (See Table 1), key components of the RNA induced silencing complex (RISC); AGOs activate and cleave target mRNA within the RISC complex . 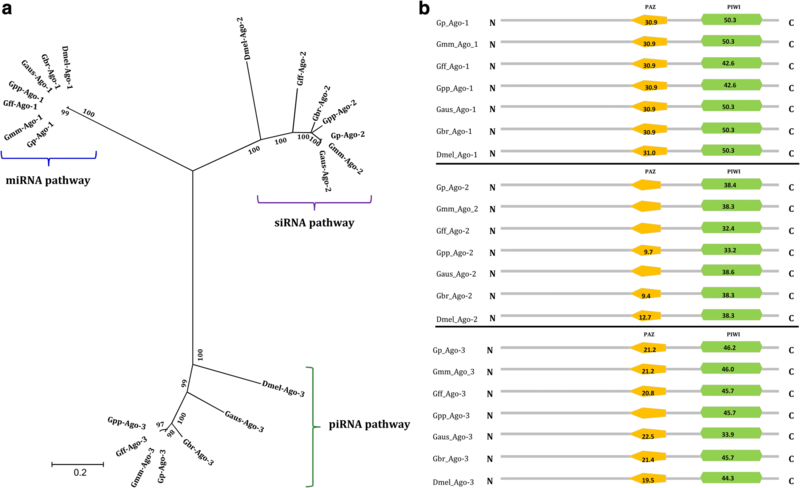 The identification of AGOs in the six tsetse species underscores the conservation of the RNAi machinery in Glossina species. Phylogenetically, the three AGO proteins segregated into distinct clusters with their orthologs in D. melanogaster, which corresponded to the siRNA, microRNA and piRNA pathways of the RNAi machinery (Fig. 1a). The phylogenetic clustering was supported by robust bootstrap values. Additionally, similar to the D. melanogaster AGO family proteins, their orthologs in Glossina species contained the critical functional domains, i.e. the PAZ domain (for dsRNA binding) and the PIWI domain (executioner of the RNase activity) (Fig. 1b). These results strongly suggest that the three RNAi machinery pathways are functional in Glossina spp. The bioinformatics analysis of the DCR protein family did not result in the identification of the homolog to the Drosophila DCR1 protein in G. pallidipes and G. brevipalpis, but the other Glossina species included in this study contained a DCR1 protein homolog (Fig. 2a). However, homologs to the Drosophila DCR2 protein were present in both G. pallidipes and G. brevipalpis, suggesting that DCR2 might be involved in both siRNA and miRNA pathways, at least in these species. However, DCR2 was lacking in G. p. palpalis and G. austeni (Fig. 2a), implying that in these two species DCR1 might be involved in both siRNA and miRNA pathways. Homologs to both DCR1 and DCR2 were found only in G. m. morsitans and G. f. fuscipes suggesting that in these species they may be involved in two separate pathways (e.g. miRNA and siRNA) as reported in Drosophila . Drosha was present in all six tsetse species investigated (Fig. 2a). Our bioinformatics analysis revealed the presence of all the functional motifs in the identified DCR (N-terminal helicases, DCR- dsRBF, PAZ, two C-terminal RNA III, and dsRBD) and Drosha (C-terminal RNA III and the dsRBD) protein homologs, which were organized as in their orthologs in D. melanogaster (Fig. 2b). Notably, no major differences (phylogenetic and domain architecture) were observed between the DCR1 or DCR2 protein sequences of the tsetse species containing one or both DCR proteins (Fig. 2a and b). 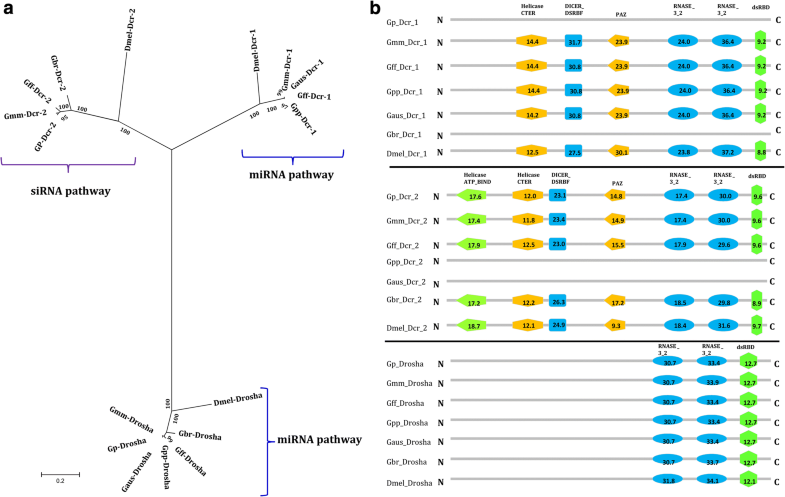 The presence of the functional domains in DCR and Drosha homologs could imply the conservation and functionality of both siRNA and miRNA pathways in tsetse. As indicated above, the piRNA pathway is independent of DCR implying that function of this pathway may not be affected by the presence or function of this protein. Having identified the core genes involved in the RNAi machinery pathways, we determined whether GpSGHV infection induces an RNAi response. Using G. pallidipes as the model species, and due to the absence of DCR1 in this Glossina species (See Fig. 2), we quantified the expression levels of the AGO family (AGO1, AGO2 and AGO3), DCR2, and Drosha in flies injected with the virus suspensions compared to the PBS-injected control flies. Additionally, we correlated the expression levels of these RNAi-related genes to the level of virus replication by quantifying the expression levels of GpSGHV odv-e66, a conserved and late viral gene. Compared to the control (PBS-injected) fly group, the expression of odv-e66 increased significantly with time (t = 8.657; d.f. = 44; P < 0.001) (Fig. 3a), implying active replication and late gene expression of the virus in the injected flies. This increased virus replication was accompanied by a significant increase in the expression level of AGO1 (t = 2.306; d.f. = 44; P = 0.026) and AGO2 (t = 3.334; d.f. = 44; P = 0.00174) but not AGO3 (t = 1.651; d.f. = 44; P = 0.106), of which the AGO2 (involved in siRNA pathway) was the most upregulated (compare panels B, C and D in Fig. 3). Similarly, to the AGO genes DCR2, which may be involved in both siRNA and miRNA pathways in G. pallidipes, was also found to be significantly upregulated (t = 3.968; d.f. = 44; P < 0.001) in response to the virus injection (Fig. 3e). However, unlike AGO and DCR, the expression levels of Drosha showed no significant increase (t = 0.601; d.f. = 44; P = 0.551) in the virus-injected flies compared to the levels observed in the PBS-injected flies (Fig. 3f). This suggests that Drosha, part of the miRNA pathway, is not involved in the immune response against a lytic infection by GpSGHV. Full statistics for each regression are given in Additional file 1. We also compared the expression levels of the DCR and AGO family genes in the virus-injected G. pallidipes flies described above with the expression levels in symptomatic (flies with overt SGH symptoms and high virus titers) and asymptomatically infected individuals (flies with low virus titers) (t = 16.72; d.f. = 10; P < 0.001) (Fig. 4a). We found that AGO1 (t = − 5.454; d.f. = 10; P < 0.001), AGO2 (t = − 3.899; d.f. = 10; P = 0.00363) and Drosha (t = − 3.549; d.f. = 10; P = 0.00623) were significantly downregulated in symptomatic G. pallidipes flies as compared to asymptomatically infected flies (Fig. 4b). There was no difference in DCR2 (t = 1.318; d.f. = 10; P = 0.2202), or AGO3 (t = − 0.858; d.f. = 10; P = 0.413) expression between the asymptomatic and symptomatic infected flies (Fig. 4b). We also assessed the impact of AGO2 knockdown on GpSGHV infection. The AGO2 gene, which is involved in the siRNA pathway, was chosen for knockdown largely because its expression levels were significantly modulated in both the virus-injected flies (upregulated; see Fig. 3c) and symptomatic infected flies (downregulated; See Fig. 4b). Notably, compared to the flies injected with nuclease-free water, injection of flies with the dsRNAs did not cause any difference in mortality rate. 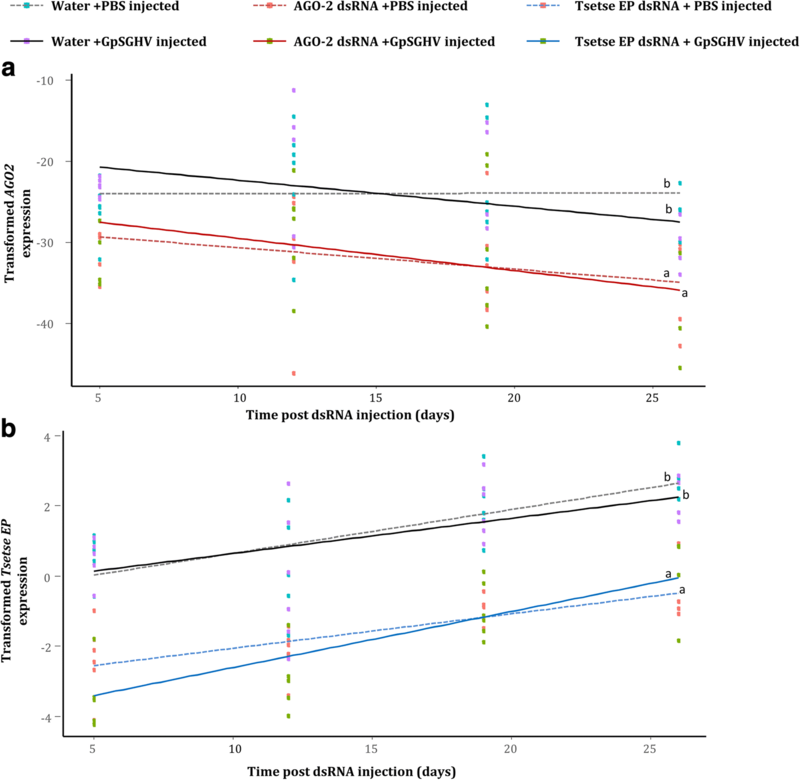 The injection of dsRNAs specific for AGO2 and tsetse EP in addition to PBS or virus injection resulted in a significant decrease in the expression levels of both AGO2 (AGO2dsRNA/PBS cf. water/PBS: t = − 4.265; d.f. = 42; P < 0.001, AGO2dsRNA/virus cf. water/virus: t = − 3.543 d.f. = 42; P < 0.001) (Fig. 5a) and tsetse EP (TsetseEPdsRNA/PBS cf. water/PBS: t = − 5.392; d.f. = 40; P < 0.001, TsetseEPdsRNA/virus cf. water/virus: t = − 6.798; d.f. = 40; P < 0.001) (Fig. 5b), respectively, compared to the water-injected control flies. We then assessed the effect of AGO2 knockdown on virus infection by quantifying expression levels of the selected viral genes, odv-e66, DNApol, SGHV038 and SGHV091. AGO2 knockdown did not have a significant impact on the transcript levels of any of the selected viral genes; odv-e66 (t = − 1.861; d.f. = 119; P = 0.391), DNApol (t = − 0.422; d.f. = 119; P = 0.674), SGHV038 (t = − 0.179; d.f. = 119; P = 0.858) and SGHV091 (t = − 0.877; d.f. = 119; P = 0.382) compared to the controls (Fig. 6a, b, c and d). As expected, knockdown of tsetse EP, which is not associated with the RNAi machinery, did not affect the expression levels of these selected viral genes. The transformations and parameters for all regression analyses are given in Additional file 1. In the current study, we have investigated the potential involvement of the RNAi machinery during GpSGHV infections in G. pallidipes by quantifying the expression of both the host (AGO, DCR and Drosha) and four viral genes. The finding that AGO and DCR proteins in Glossina species contain the functional domains or motifs known to mediate the RNAi response strongly indicate that the RNAi machinery is functional in tsetse, presumably in a similar version as reported in Drosophila . It is known that the presence or absence of these functional domains in AGO or DCR proteins affects the efficiency of the RNAi response. For instance, Gu et al. discovered that although AGO2 lacking the PAZ domain interacts with duplex siRNAs, the truncated protein was unable to unwind the siRNAs or eject the passenger RNA strands. The passenger strand should be degraded or ejected from the siRNA duplex to allow the guide strand to be incorporated into the RISC complex and target the mRNA . Moreover, the results from our phylogenetic analysis confirmed that the predicted AGO proteins from the various tsetse species analyzed clustered with those of Drosophila. The presence of only DCR2 in G. pallidipes and G. brevipalpis, and only DCR1 in G. p. palpalis and G. austeni suggest that in these species only one of the respective proteins is involved in the siRNA and miRNA pathways. In contrast, genes for both DCR1 and DCR2 proteins were found in G. m. morsitans and G. f. fuscipes. Given that in Drosophila DCR1 and DCR2 are involved in the miRNA and siRNA pathways, respectively , it is possible that these two proteins are involved in these pathways in these two Glossina species as well. Alternatively, they might be involved in both pathways, as suggested for the other Glossina species as there were no differences in DCR1 or DCR2 protein sequences of species with one or both DCR proteins, which could be linked to the RNAi pathways. The DCR proteins can be involved in both siRNA and miRNA pathways  or be involved in the separate pathways . Taken together, the identification of genes for AGO and DCR proteins may, in principle, be an indication of a robust RNAi silencing response in Glossina species [40, 41]. Currently, the mechanism(s) permitting the covert (asymptomatic) GpSGHV infection in G. pallidipes, and the reactivation from viral persistence/latency to overt symptomatic infection that is associated with overt SGH symptoms , are poorly understood. Our finding of significant upregulation of the expression of AGO2 in GpSGHV-injected flies suggests that the virus infection induces the host’s siRNA-mediated response, presumably to inhibit the virus infection. Notably DCR2, which might be involved in both siRNA and miRNA pathways in G. pallidipes, was similarly upregulated during virus infection. The upregulated expression of both AGO2 and DCR2 post virus injection in G. pallidipes, which are key components in the dsRNA-mediated gene silencing in several insects, suggests a functional RNAi-mediated innate immunity response in Glossina species. However, more work is required to elucidate the precise details of this pathway in Glossina as well as the involvement of the RNAi machinery in other members of the Hytrosaviridae family. In contrast to the above-mentioned increased levels of AGO2 and DCR2 in virus-injected flies, the comparative analysis of the expression of the two genes between asymptomatic and symptomatic infections showed a significant downregulation of the expression of AGO2, but insignificant upregulation of DCR2 in the flies exhibiting diagnostic SGH symptoms. The high expression of siRNA pathway genes in the virus-injected flies suggests a tight control of the virus via the RNAi response during asymptomatic GpSGHV infections. However, during symptomatic infections as evidenced by increased virus titers, the siRNA pathway may be compromised (as supported by the low expression of AGO2) enabling the virus to escape the RNAi-mediated innate immunity, thereby increasing virus titers and in turn causing the detectable SGH symptoms. A similar outcome has been documented in the case of the African malaria mosquito, Anopheles gambiae, where dsRNA-mediated silencing of AGO2, which functions in conjunction with DCR2 in this mosquito, resulted in increased O’nyong-nyong virus (ONNV) viral loads . It should be noted that, due to its involvement in both the siRNA and miRNA pathways, DCR2 was not considered a suitable candidate for the knockdown assays in this study. Therefore, we assessed the potential involvement of dsRNA-mediated gene silencing (siRNA pathway) in G. pallidipes by knockdown of AGO2. Several examples of the function of RNAi in insects have been clearly demonstrated, including for species from the orders Diptera, Dictyoptera, Isoptera, Hymenoptera and Orthoptera [43, 44]. In the case of tsetse flies, Walshe et al.,  showed that micro-injection of dsRNA into 6–8 day-old G. m. morsitans flies could persistently silence expression of tsetse EP, a gene that is demonstrated to protect the fly against establishment of trypanosome infections in the midgut . In the current study, the knockdown of AGO2 in G. pallidipes did not alter the transcript levels of the selected GpSGHV genes implying that AGO2 knockdown had no effect on the GpSGHV infection. These findings are in contrast to previous results; for instance in Drosophila melanogaster in which flies that were deficient in the DCR2 protein showed increased susceptibility to infection by members of three different RNA virus families; i.e. FHV (Nodaviridae), DCV (Dicistroviridae), and SINV (Togaviridae) . In general, many studies have led to the conclusion that flies that contain mutations in genes that encode components of the siRNA pathway (including DCR2 and AGO2) or the Janus kinase/signal transducers and activators of transcription (JAK-STAT) pathway, are not only more sensitive to infection by several viruses, but also harbor higher viral titers than their wild-type counterparts. The JAK-STAT pathway is also a conserved insect innate immune antiviral response [13, 26, 31, 38, 47]. In another report, D. melanogaster defective for the AGO2 were found to be hypersensitive to infections by DCV, an infection which also supported a 1000-fold increased production of progeny virus . The results obtained from the current study showed that reduction of RNAi efficiency in G. pallidipes did not cause a significant impact on the fly immunocompetence. Notably, in addition to the RNAi pathway investigated in this study, the JAK-STAT, immune deficiency (imd) and Toll immune pathways are also involved in elimination of viruses [48–50]. The presence of these innate immune pathways may indicate that following the interruption of the RNAi pathway in G. pallidipes flies in our study alternative antiviral pathways in these flies were able to control the virus infections. Given the high diversity of pathogens, their elimination by host organisms is challenging and therefore many organisms, including insects, employ multiple mechanisms to deal with them. The RNAi machinery, particularly the siRNA pathway, plays a central role in insects by specifically recognizing and eliminating invading pathogens and other invasive elements such as transposons. This study has elucidated important milestones in the infection of GpSGHV in Glossina spp. We detected RNAi key genes in all the analyzed Glossina species, which may indicate a functional antiviral role of RNAi machinery in tsetse flies. In G. pallidipes, the model Glossina species in this study, the siRNA pathway genes AGO2 and DCR2 were upregulated during virus infection, which confirmed the involvement of the RNAi response in the flies’ defense against GpSGHV. We also noted that in G. pallidipes, the siRNA pathway was compromised during symptomatic infection as evidenced by the low expression of AGO2. However, although knockdown of AGO2 in G. pallidipes did not have an impact on virus infection, it would be worthwhile to further investigate the long-term effects of the gene knockdowns on GpSGHV transmission and the expression of SGH symptoms in F1 progeny produced by the parents with the knockdown. The F1 generation is of interest since induction of SGH symptoms does not occur in the parental generation of flies that are intra-hemocoelically injected with the virus but are observed in the subsequent F1 generation produced by injected mothers . It may therefore be important to determine whether the dsRNA-mediated gene silencing is a heritable trait, as has been demonstrated in other studies . The next question would be to determine which factors (exogenous or endogenous) trigger the transition from the asymptomatic to symptomatic state in colonized and wild flies. Together, the approach and results of the current study offer a starting point for further investigations into Hytrosaviridae family members and may open novel strategies to control SGHVs in insect production facilities. The G. pallidipes flies used in this study were obtained from the colony maintained at the Joint FAO/IAEA IPCL, Seibersdorf, Austria. G pallidipes was selected for this study because, unlike other species, it shows both asymptomatic and symptomatic virus infections . The experimental G. pallidipes flies were maintained in controlled insectaria with 70–80% relative humidity, 24 ± 1 °C temperature and 12 h photo-phase. The flies were fed for 10–15 min, 3 times per week on defibrinated bovine blood using an in vitro membrane feeding system . The virus inoculum was prepared from a one pair of hypertrophied salivary glands (with overt SGH symptoms) dissected from G. pallidipes male flies; viral titers in the gland homogenates (in PBS) were estimated by qPCR as described previously [3, 35]. The experimental flies were injected with 2 μl of the virus inoculum estimated to contain ~ 106 virus genome copies per μl. To determine whether the G. pallidipes genome contains the key RNAi pathway genes, AGO, DCR and Drosha sequences were retrieved from the VectorBase database  using as query sequences the annotated homologous gene sequences of G. morsitans morsitans  (BLASTp; e-value ≤10− 2). To determine the conservation of RNAi in Glossina species, sequences of these core genes for G. fuscipes fuscipes, G. palpalis palpalis, G. austeni and G. brevipalpis were similarly retrieved from VectorBase. The functional domain architecture of the retrieved AGO, DCR and Drosha sequences was analyzed using the ScanProsite tool . Homologous search of the retrieved sequences was performed to determine the relatedness of these sequences with those of D. melanogaster for which RNAi mechanisms and pathways have been demonstrated. Multiple alignments of protein-coding loci of the identified gene sequences were performed in BioEdit . Phylogenetic analysis was performed with MEGA6 using default settings for Maximum-Likelihood (ML) based on the General Time Reversible model with gamma distributed substitution rates with 1000 bootstrap replications . To investigate the impact of GpSGHV on the core RNAi genes in G. pallidipes, two groups of teneral flies (newly-eclosed and non-fed; 50 females and 50 males per group) were injected with either the virus inoculum as described above, or phosphate buffered saline (PBS) as control. Following the injections, four females and four males were sampled within 1 h post injection and at 7, 14 and 21 days post injection (dpi). Total RNA was extracted from individual whole bodies of the sampled flies using Trizol reagent (Invitrogen, Paisley UK) according to the manufacturer’s instructions. Contaminating DNA was removed from the extracted RNA by treating the samples with DNase 1 (Invitrogen, Paisley, UK), after which the concentration of the RNA was quantified using a Nanodrop ND-1000 spectrophotometer (Thermo Fisher Scientific, Wilmington, DE). Complementary DNAs (cDNAs) were synthesised using the SuperScript® III Reverse Transcriptase kit (Invitrogen, Paisley UK) following the manufacturer’s instructions. The iQ SYBR green supermix (Bio-Rad laboratories, Hercules, CA) was used for RT-qPCR analysis. The viral infection was assessed by quantifying the expression of GpSGHV odv-e66, a conserved, late viral gene (highly expressed upon viral genome replication), followed by expression analysis of AGO, DCR and Drosha transcripts, using the PCR cycling conditions: 95 °C for 3 min, followed by forty cycles of 95 °C for 10 s, 60 °C for 1 min, then 95 °C for 1 min and 55 °C for 1 min, using the primers shown in Table 2. The tsetse housekeeping gene β-tubulin was used to normalize gene expression. To determine the differential expression of AGO, DCR and Drosha between asymptomatic and symptomatic infected flies, 10-day old F1 progeny flies produced by virus injected mothers were screened under a stereo microscope for the occurence of diagnostic SGH symptoms. Total RNA was extracted from whole bodies of 8 asymptomatic and 8 symptomatic infected flies (4 females and 4 males). The viral infection was estimated by quantification of the GpSGHV odv-e66 transcripts, followed by expression analysis of the three genes as described above. These expression analyses were replicated three times (biological replicates). The optimal regions on the AGO2 mRNA for the synthesis of dsRNA constructs were determined by siRNA design software (default setting) , which uses three predictive steps; (i) selection of functional siRNA sequence, (ii) selection of siRNA sequence with reduced off-target effects and (iii) elimination of near-perfect matched off-target genes. The identification of off-targets was performed by BLAST (BLASTn; e-value ≤10− 2) search of VectorBase. Following identification of the siRNAs, primers for dsRNAs synthesis were designed to flank the most effective siRNAs based on the above-described steps and a T7 promoter sequence added on each primer (See Additional files 2 and 3). To generate dsRNA to knockdown AGO2, total DNA was isolated from G. pallidipes using the Qiagen DNeasy Blood and Tissue kit (QIAGEN Inc., Valencia, CA). The extracted DNA was subsequently used to produce T7 tailed PCR amplicons of AGO2 using primers designed to contain 5′-T7 promotor sequences (See Table 2). These primers allowed dsRNAs transcription using the Hiscribe T7 Quick high yield RNA synthesis kit (New England Biolabs, UK) according to the manufacturer’s instructions. Template DNA was removed from the transcription reaction by DNase treatment, as described in the transcription kit. The synthesized dsRNAs were purified using MEGAclear columns (Ambion, ThermoFisher Scientific, USA) and eluted in 50 μl nuclease free water. The tsetse EP gene, an immune response gene with extensive glutamic acid-proline dipeptide repeats, that has been successfully knocked down in tsetse, [45, 46] was used to assess the efficiency of the knockdown treatment (i.e. by measuring the expression of the tsetse EP gene). To investigate the impact of AGO2 knockdown on GpSGHV infection, teneral G. pallidipes flies were divided into three groups each consisting of 40 females and 40 males and offered one blood meal. After 48 h, two of three groups were injected with 4 μl of either AGO-2 or tsetse EP dsRNAs (2.5 μg/μl dsRNA in RNase free water) (See the procedure in Additional file 4). 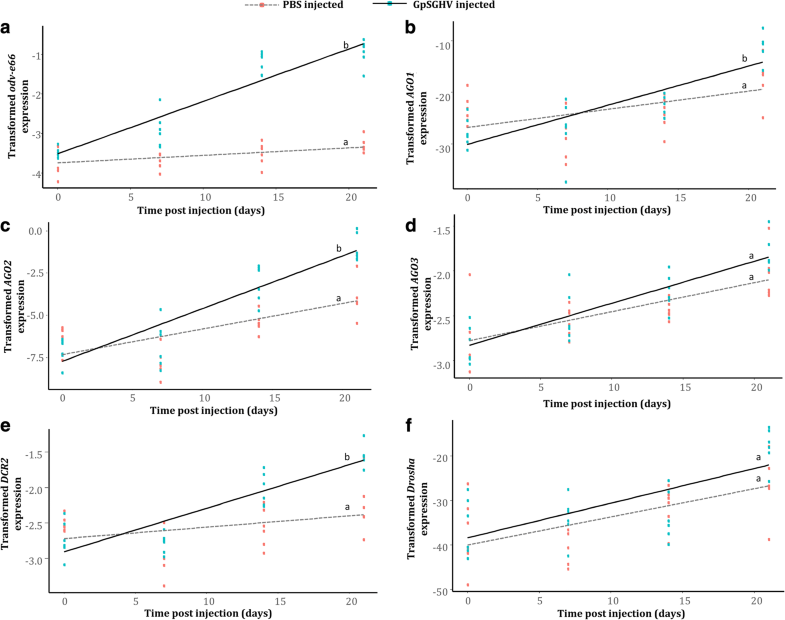 The selection of this dsRNA dose was optimized for effective knockdown based on previous bioassays on dsRNA-mediated gene knockdown in tsetse flies [45, 46]. The third group of flies (an additional negative control) was injected with RNase-free water. For the injections, flies were anaesthetized by chilling (~ 5 min) on ice, and subsequently injected in the dorsolateral surface of the thorax. Five days after the dsRNAs/RNase-free water injections, half of the injected flies (20 females and 20 males) from each group were injected with 2 μl of the virus suspension as described above, while the other half were injected with PBS. This time point (i.e. 5 days post dsRNA injection) was selected because successful gene knockdown in tsetse has been shown to occur after ~ 3 dpi , implying that the 5 dpi in our case ensured that the virus was injected after successful knockdown. To monitor the impact of AGO2 knockdown on GpSGHV infection, 3 females and 3 males were sampled from each of the above described treatment groups at 1 h post injection, and at 7, 14 and 21 dpi. The samples were stored at − 20 °C until further analysis as described below. To assess the effect of AGO2 knockdown of GpSGHV replication, total RNA was extracted and cDNA synthesized as described above from the frozen fly samples collected from different time points post dsRNA and virus injection. The efficiency of gene knockdowns was assessed by quantifying (by RT-qPCR) AGO2 and tsetse EP gene transcripts using the qPCR primer sets listed in Table 2. The impact of AGO2 knockdown on GpSGHV infection was assessed by RT-qPCR quantification of mRNA transcripts of the selected conserved GpSGHV genes; the per os infectivity odv-e66 (SGHV005) gene, DNApol (SGHV079) gene involved in DNA replication, a tegument gene (SGHV038) and capsid gene (SGHV091) [59, 60]. Note that a clear correlation between the GpSGHVodv-e66 gene transcripts and the total virus copy numbers has been previously reported , which may demonstrate the impact of AGO2 knockdown on virus replication. All quantitative RT-qPCR results were representative of at least three independent biological experiments, each with three technical replicates. Statistical differences in the expression of the above described host and viral genes between the different treatments and the controls were performed with RStudio v1.0.143  (R v3.4.0 ) using the packages lattice v0.20–35  and MASS v7.3.47  The obtained data were visualized using the ggplot2 v2.2.1 package  available within the RStudio platform. Data was checked for normality and transformed where necessary using the Box-Cox routine. The data was log transformed where the confidence interval of lambda includes 0 and transformed with (xλ-1)/λ in other cases. T-tests were used for the comparison of RT-qPCR data. The authors acknowledge Prof. Serap Aksoy of Yale University for insightful discussions during the conception of the study and Hasim Mohammed, Carmen Marin and Henry Adun of the Joint FAO/IAEA Insect Pest Control Laboratory (IPCL), Seibersdorf, Austria for technical assistance. This work was financially supported by the Joint FAO/IAEA Division of Nuclear Techniques in Food and Agriculture, Vienna, Austria (CRP #D42015) and Wageningen University (WU). Both FAO/IAEA Division and WU participated in the design of the study, provided the resources for running of the experiments and writing of the manuscript. Materials described in the manuscript, including all relevant raw data, are deposited in this link https://dataverse.harvard.edu/dataset.xhtml?persistentId=doi:10.7910/DVN/ZN20Q6. VJM, KHM and AMMA conceived the study. AMMA, VJM, KHM and VOMM: designed, supervised the research and writing of the manuscript. MIK, AGP, AMMA: conducted the experiments, collected and analyzed data and prepared the figures. MIK, AGP, MJBV, KHM, VJM, VOMM, AMMA: participated in the writing of the manuscript. All authors have read and agreed to the contents of the final manuscript and confirm that the manuscript conforms to the journal’s policies.